Home / Stock Picks / Hot Stocks / Is New Age Beverages Stock a Good Cannabis Play? Is New Age Beverages Stock a Good Cannabis Play? We’re almost to the point where my grandmother will start asking about cannabis stocks (although she’ll probably call “cannabis” something different). In the investment community. though, pot stocks are nothing new as investors have been looking for the best way to play this trend for some time. Aurora Cannabis (NYSE:ACB), Canopy Growth (NYSE:CGC), Tilray (NASDAQ:TLRY) and New Age Beverages (NASDAQ:NBEV) are just some of the ways to play the proliferation of pot these days. So that begs the question: what stock should investors buy if they want exposure to cannabis? And, since this column is primarily about New Age Beverages, should they buy NBEV? New Age Beverages stock can work for a couple different types of investors. First of all, it works for those who can readily handle more risk and heavy volatility. Those who are looking for exposure to pot stocks but don’t want wild volatility can consider a name like Canopy Growth. In my view, it’s the most stable pot name. An even more conservative strategy would be to buy Constellation Brands (NYSE:STZ), which owns a massive chunk of Canopy Growth. STZ now owns almost 40% of Constellation stock and will benefit from any upside in the name. However, investors can fall back on Constellation’s great alcohol business in the meantime. The beverage business of NBEV, by contrast, is not quite as consistent. This company, which has a market cap of $180 million, has been wildly volatile, as shown by its recent trading. The shares went from $1.50 to $10 and back to $3.75 in a matter of weeks. Like I said, New Age Beverages stock is not for the faint of heart. Investors who want to buy several pot stocks could consider NBEV stock. Like I said, I prefer CGC or STZ to any other pot stocks I’ve mentioned, including NBEV. But some want more action or more exposure than CGC or STZ can offer. Analysts on average currently expect NBEV’s sales to grow just 4.7% this year to $54.6 million, although that does come after the company’s sales doubled in 2017. Analysts’ consensus estimate calls for the company’s growth to accelerate to 28.5% next year, with its sales reaching $70.2 million. Maybe NBEV will meet that estimate. But with a volatile name like this, it’s too risky to trust an 18-month estimate. Analysts’ consensus estimate calls for a loss of 23 cents per share in 2018 and an EPS of 0 cents per share in 2019. Currently trading at about 3.3 times this year’s average sales estimate, New Age Beverages stock isn’t wildly overvalued, but it’s not exactly a bargain, particularly with the stock market behaving so erratically lately. New Age’s debt load, which came in at $9.2 million last quarter, isn’t monstrous either, but it dwarfs the $213,000 that NBEV has in the bank. I will concede that the company’s current assets can cover its current liabilities, but that’s only thanks to the $9.5 million that the company has in inventory. It’s clear that NBEV isn’t the worst company in the world, not by a long shot. But NBEV’s volatility is going to keep me from buying it. NBEV stock is simply too volatile. As much as I would love to nab a ten-bagger, the volatility of NBEV stock is just too high. I can’t imagine buying NBEV near $7 only to see my investment get cut in half in just a few weeks. I might as well be playing weekly options. Because of the explosive cannabis trade, this name got way too hot earlier this year. How do we know that after we buy NBEV stock today, it won’t end up declining below $2 again, representing another 50% plunge? That could happen, and that’s why I won’t buy it. There will be traders that have to play it, though. Those people should perhaps wait for a close above the 50-day moving average. While not shown on the chart because it’s a weekly chart and not a daily chart, that mark is currently and appropriately near $4.20. For those who want to go long based on the weekly chart, consider using a close below the 50-week moving average as a stop-loss to limit risk. Conservative buyers may want to wait for a pullback to this level before buying NBEV. 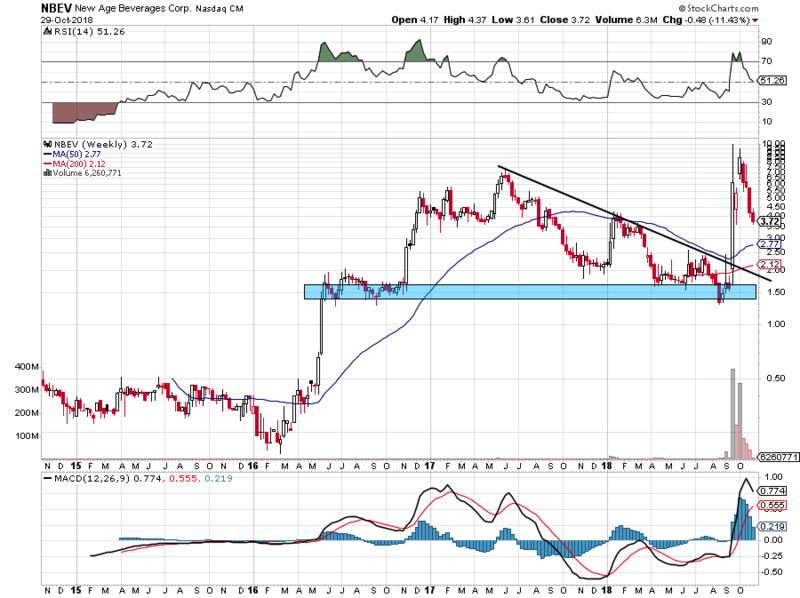 I would consider opening a speculative position back near $1.50, which is the backside of downtrend resistance (as shown by the black line) and firm support (represented by the blue box), although it’s possible New Age Beverages will never get there. Article printed from InvestorPlace Media, https://investorplace.com/2018/10/is-new-age-beverages-stock-a-good-cannabis-play/.